Our destination was the house of Claire and Alex who surfed our couch in January in Adelaide. We found an open patisserie and a cafe in Charleville (these are often provided separately in France which makes it difficult to eat and drink something at the same time). Then began our ride through beautiful countryside with fields of grain, forests, some proper hills (the first of our trip), villages, that sort of thing. Everything was quiet, hardly any cars on the road, shops closed, because of Bastille Day. Few French villages have much commerce any more, so you seldom find a boulangerie or cafe. We saw a bread van that travels around the countryside loaded up with baguettes to sell in each village. We decided to aim for Rethel, a reasonable sized town, in the hope of observing some 14 July festivities and arrived at the perfect time. There was a gathering of people, a town band, some VIPs, a local uniformed brigade and the gendarmerie on hand to direct the traffic. 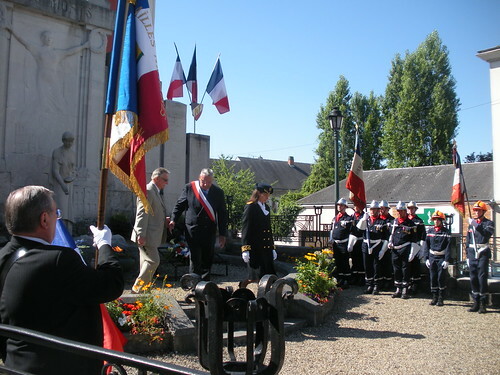 The band then lead the procession to the local memorial at which a short ceremony took place including some saluting, lowering of flags and the playing of the Marseillaise. Then band played with good spirit but without good intonation and that was just perfect! The day was warming up a lot so we purchased our first French baguette and had a picnic under the trees. Then on the road again. One of the villages we passed was Poilcourt-Sydney where Australian soldiers fought in WW1. The Tour de France passed through here a week or so ago. Then to Orainville near Reims where Claire and Alex and their dog Charlie were waiting for us. It was great to see them again and hear about their travels after they left Adelaide. They are now hoping to find jobs in France, but it’s not easy. A huge thunderstorm with wind and rain descended. We leapt into the car and drove to Laon, a medieval town on top of a hill with a 12th century cathedral. We passed several war cemeteries along the way. We asked Alex the name of a nearby village. He didn’t know it but pointed out that there are 36,000 villages in France so it’s not considered necessary to know them all. Claire cooked a French meal for us – escargots, salade de chevres chaud, magert de canard and figues au miel followed by fondant au chocolat! Delicieux. Now we’re getting in mode for Paris. Claire and Alex dislike Paris and say they would never live there, Parisiennes are never happy, they are so stressed, the cost of living is so high, the traffic is terrible. But I think we are going to enjoy it! This entry was posted on 15 July 2010 at 8:04 am and is filed under France. You can follow any responses to this entry through the RSS 2.0 feed. You can leave a response, or trackback from your own site.